Select theaters July 24; VOD and iTunes August 4. Ever since John Cassavetes started directing movies, indie films have wrestled with the tension between fiction and nonfiction. One means of finding a good balance, employed more and more frequently of late, involves casting non-professional actors as versions of themselves and then constructing a story around them. That way, the movie will feel bracingly authentic from moment to moment while still offering the satisfactions of drama. (Recent examples include Andrew Bujalski’s Beeswax and Josephine Decker’s Butter On The Latch.) It’s a tricky line to walk, though, and Five Star, the sophomore feature from director Keith Miller (Welcome To Pine Hill), winds up rocking a combination that amounts to the worst of both worlds. To the extent that the film has a narrative, it’s an overly familiar one—just your basic cautionary tale about gang life. But those street-smart clichés are still more compelling than the details of the characters’ everyday lives, which too often cross the line that separates incisive low-key naturalism from mundane tedium. The main attraction here is James “Primo” Grant, a longtime member of the Bloods who makes his screen debut as Primo, a longtime member of the Bloods. First seen delivering an emotionally charged monologue about the pain he experienced due to being in prison on the day his son was born, Primo takes a paternal interest in John (John Diaz), whose father had been a highly respected gang leader until he was shot and killed, allegedly by a stray bullet. Because Primo is a “five-star general” in the organization, his seal of approval gives John instant respect in the Fort Greene housing project where they both live, and John soon begins working for Primo as a drug courier to make some easy extra cash. Unanswered questions remain, however, about John’s father’s death, and things come to a head when one of Primo’s most trusted soldiers claims that John never showed up with a package he was supposed to deliver. That’s pretty much all the narrative juice there is in Five Star, and these banal confrontations, while arguably more realistic than any memorable scene from The Wire, don’t exactly get the blood racing. But neither does the film succeed in making Primo or John especially memorable or compelling, even though both Grant and Diaz turn in solid, charismatic performances. Miller devotes a hefty percentage of its 83 minutes to John’s blandly sweet, go-nowhere romance with a young girl named Jasmin (Jasmine Burgos), occasionally tossing in scenes of Primo playing with his four little kids. 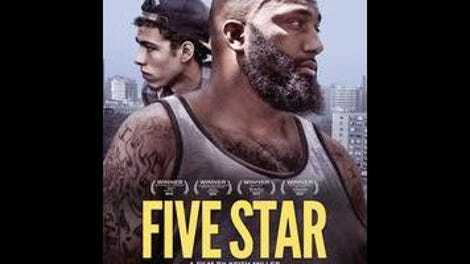 Juxtaposing domesticity and gang violence is no longer revelatory, however, and nothing in Five Star feels especially fresh or disarming. The one potentially novel element—Primo apparently being so hard up for money, despite running drugs, that he takes odd jobs as a bouncer at swanky nightclubs—isn’t explored in enough depth to be interesting, and winds up having no bearing on the skeletal story. There’s just not enough meat on these bones, and what meat there is has been thoroughly chewed over. Authentic casting doesn’t guarantee anything.